May said she will hold further talks on the backstop. UK PRIME MINISTER Theresa May has announced her much-anticipated “plan B” on Brexit, after her original deal was roundly defeated last week. May said she plans to return to Brussels to discuss changes to the deal she agreed with EU leaders last month, despite an overwhelming rejection of the draft text by MPs last week. “I believe we can make progress” on the so-called Irish backstop, she told parliament, adding that she would be consulting with MPs about possible changes and “then take the conclusions of those discussions back to the EU”. Addressing the House of Commons, she said after last week’s vote it became “clear the government’s approach had to change”. 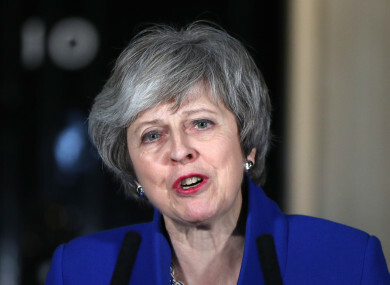 The UK prime minister ruled out holding a second referendum, as it would create a concerning precedent. May added that it could “damage social cohesion by undermining faith in our democracy”. She said everyone had to work together to find a solution, adding that there is widespread concerns around Britain leaving the EU with no deal. “The right way to rule out no-deal is for this House to approve a deal with the European Union,” she said. The other way to rule out a no-deal would be to revoke Article 50, but she ruled this out as it would go against the referendum result. On reports that the Good Friday Agreement might be reopened, she said she wanted to be absolutely clear that she will not reopen the Belfast Agreement. She said this was never considered. Addressing the issue of the controversial backstop, she said there is a fear the UK could be “trapped” in the backstop. She promised to hold further conversations on this issue, and will then take the feedback from these talks back to the EU. May said will now meet with the DUP, members of the opposition, trade unions, and members of civil society so as to be more “open and inclusive”. In her speech today, May said she will scrap fees for EU citizens who want to stay in Britain. Having listened to concerns from members and organisations, she confirmed that when the new scheme is rolled out the British government “will waive the application fee so that there is no financial barrier for any EU nationals who wish to stay and anyone who has or will apply during the pilot fee will have their fee reimbursed”. While May hopes to win over Tory Brexiteer MPs and the DUP, Labour leader Jeremy Corbyn said nothing had changed and said the prime minister had offered nothing new. Britain will leave the European Union on March 29 without any new arrangements in place unless MPs can agree to an alternative or modified plan that the bloc can also accept. London and Brussels have spent the best part of two years working on May’s agreement, but MPs in parliament’s lower House of Commons comprehensively rejected it last week. “We welcome the commitment by the Prime Minister to rule out an extension to Article 50, the waiving of the £65 fee for EU nationals residing in the United Kingdom and the recognition that the necessary legal changes to the withdrawal agreement must be secured from Brussels. In recent days, we have had good engagement with the Prime Minister. It is encouraging to see that the core issues which led to the House rejecting the withdrawal agreement are being focused upon in a really serious manner. Meanwhile, SDLP Leader Colum Eastwood MLA hit out at May following her statement, saying her commitment to the Good Friday Agreement was “superficial”. Despite people in Northern Ireland widely supporting the backstop, the British Government continues to shamelessly pander to the DUP against the interests of people here. He said that the statement today “proves only one point – that the British State is in chaos”. Boxed into a corner, the Prime Minister is running out of time and running out of options; clinging to the DUP to help her hold onto power – despite the fact the DUP do not represent our interests nor the views of the majority of people in the North. “We have reached a critical point and with that politicians here cannot simply point the finger,” said Eastwood. Email “Theresa May rules out second Brexit referendum in Plan B speech”. Feedback on “Theresa May rules out second Brexit referendum in Plan B speech”.